The English language is awash with terms to describe the many expressions and emotions that cross the human face. 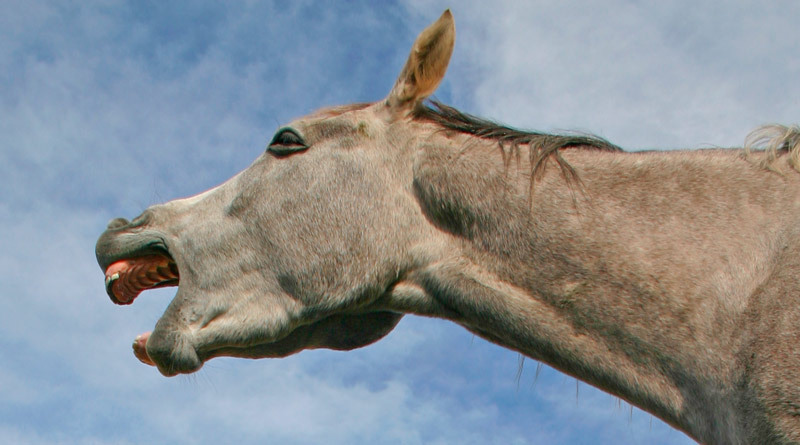 Is it possible to accurately describe a horse’s facial expression? It would seem so, according to research published in the Journal of Veterinary Behavior: Clinical Applications and Research. A study team from the Animal Health Trust says it has successfully developed an ethogram – a catalogue of observed behaviours – based around equine facial expression which they say might ultimately be able to provide insights into a horse’s level of comfort under saddle. The ethogram was tested in the study by 13 individuals, from horse-owning amateurs to veterinarians, with their level of agreement being assessed at 87 percent. Their level of horse experience had little influence on the accuracy of their assessments. It was concluded that the ethogram could reliably be used by people from different professional backgrounds to describe the facial expressions of ridden horses. “This novel work is the first step towards assessing pain in ridden horses other than through obvious gait changes or posture,” equine orthopaedic specialist Sue Dyson and her colleagues wrote. The study team said many horses that were presumed to be sound by their riders were not. Indeed, recent research indicated that owners, riders and trainers appeared to have a poor ability to recognise signs of pain when horses were ridden. “As a result, problems are labelled as training-related, rider-related, or behavioral, or deemed ‘normal’ for that horse because ‘that is just how the horse has always gone’,” they said. Facial expression ethograms have previously been used to describe pain-related behavior in horses, but there was a need for a ridden horse facial ethogram to assist in identifying pain in ridden horses, they said. Dyson, a Royal College of Veterinary Surgeons specialist in equine orthopaedics and British Horse Society instructor, reviewed close-up photographs (side-on and frontal images) of the heads of 150 ridden horse, both lame and sound, which had been photographed for reasons unrelated to the current study. Dyson in collaboration with Jeannine Berger, a specialist in veterinary behaviour, then developed an ethogram for facial expressions, with reference to previously published facial expression grading systems. It covered elements relating to head carriage, including its position on the bit (or above or behind the bit), as well as the position of the horse’s eyes, nostrils, mouth, lips, muzzle and tongue. Rein tension was also factored in. Dyson then went on to produce a training manual, which used text and photographs to describe all likely facial expressions and their combinations. Thirteen assessors, comprising four veterinarians, three equine technicians, two equine studies graduates, two amateur horse owners, an equine veterinary nurse and a British Horse Society instructor, underwent an hour-long training session and then, with reference to the manual, evaluated side-on photographs of 27 training heads. They were asked to grade features as Yes, No, or “Cannot see” when they felt it was not possible to determine whether a feature was present. The ethogram was adapted based on the results, and the same assessors blindly evaluated 30 test heads from non-lame and lame horses. It was found that four assessors consistently scored differently from the others, but the overall level of consensus among them all was assessed at 87 percent. The mean percentage of overall agreement was 80 percent. There was no difference in assessors’ scoring related to their professional backgrounds, the study team reported. Observations relating to the eye and muzzle were the least consistent, they said. Dyson and her colleagues noted recent work in the field, including the development of a Horse Grimace Scale for horses undergoing castration and the Equine Utrecht University Scale for Facial Assessment of Pain for colic. However, the study was initiated because Dyson had repeatedly observed these facial expressions in real-time. The study was supported by World Horse Welfare and the Saddle Research Trust.